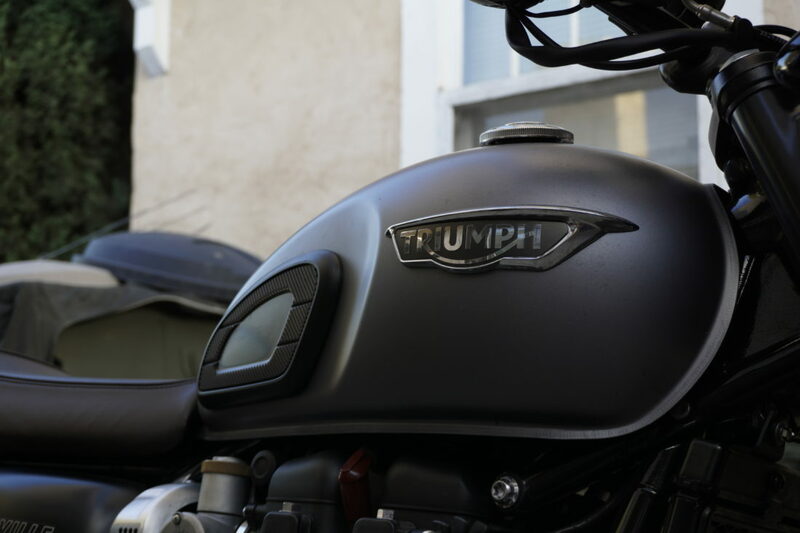 My everyday ride is a matte graphite 2017 Triumph Bonneville T120, lovingly named Grey Sonja. (Get it? After Red Sonja? The 80s action movie starring Brigitte Nielsen? You get it.) I haven’t done much to it in the way of aftermarket parts since she joined the family in January 2017, but I have a few modifications. 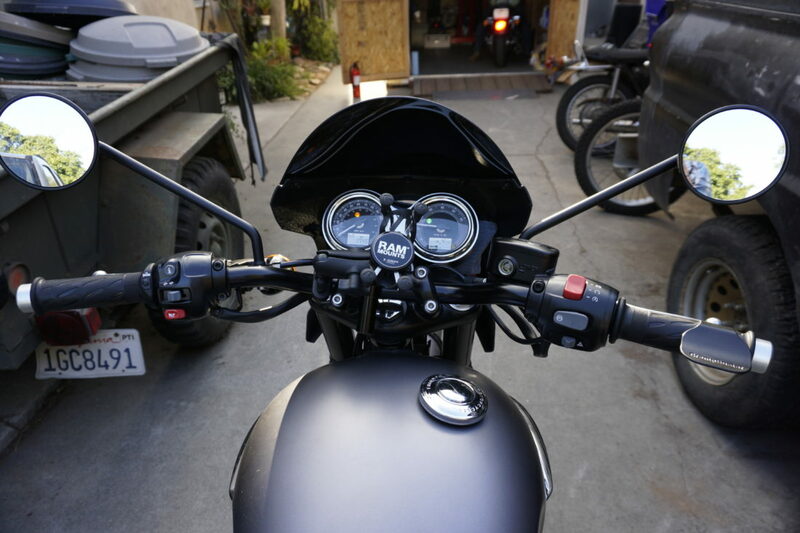 I picked up the Puig Semi-Fairing Windscreen from Revzilla shortly before Sanna and I took our mad dash to the Grand Canyon, and boy am I glad I did! I never really cared for the full cafe-racer fairing look, and neither did the traditional Triumph windscreen call out to me – but this fairing has been just right. It keeps the wind off me enough for comfort in breezy conditions while still allowing enough of a breeze to keep me cool in the summer. Sometimes I wish there was a little more room behind it for a camera or a small bag. I have a bag in there but I can really only fit a bandana and a map. 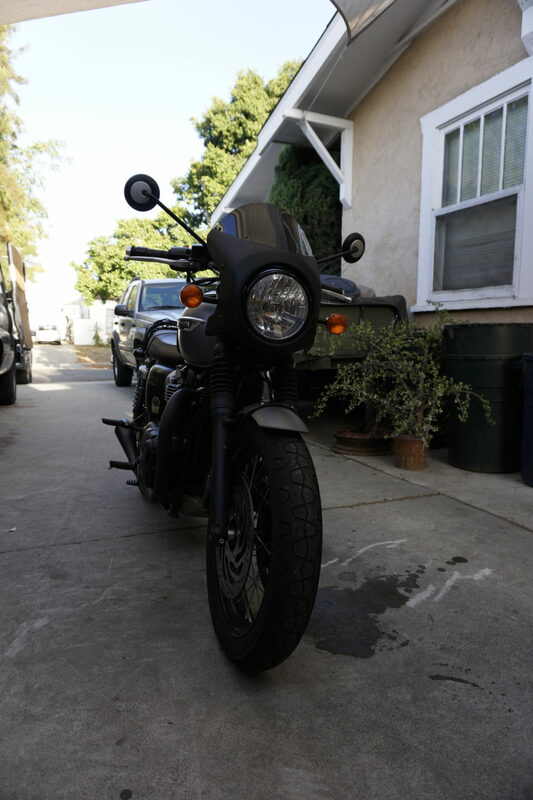 I put noisier mufflers on because…loud pipes are cool. California has a lot of restrictions for aftermarket exhaust purchases, so you will need to figure out your own out of state solutions if you’re in our great western state. These left the catalytic converter in place, so they really only affect the sound of the bike. There’s little to no performance improvements, and I did not tune the bike to adjust the fuel maps in any way. So there she is! Bike mods are a personal thing, but for me, my daily rider is the one I setup for comfort and then leave alone so I know I can rely on it when I want to ride. Stay tuned for more comfort updates though, I have a fresh part in the mail! Looks great. Love that fairing!